Hyaline cartilage. Atlas of Plant and Animal Histology. The image is from the trachea. 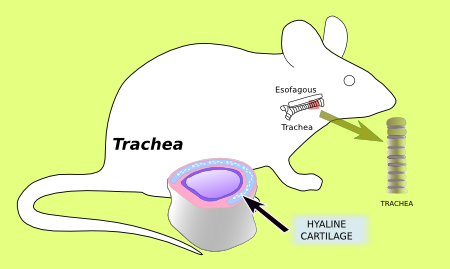 In this image, a section of the trachea of a mouse is shown. From the top to the bottom (tracheal lumen) it can be observed hyaline cartilage, connective tissue and pseudostratified epithelium lining the inner surface of the trachea. Hyaline cartilage has two parts: the perichondrium, outermost, and mature cartilage, wider and inner. The extracellular matrix of the mature hyaline cartilage shows a bluish color and uniform appearance. Type II collagen is the most abundant molecule of the extracellular matrix, although other types of collagen and proteoglycans are present as well. The extracellular matrix is secreted by chondrocytes, which are located in cavities known as cartilage lacunae. The absence of chondrocytes in some of the lacunae in this image is due to artifacts generated during the histological processing. The chondrocytes are usually associated in pairs, forming so-called isogenic groups, which are separated between each other by the interterritorial matrix. Perichondrium is a layer of dense connective tissue lining the external surface of the mature cartilage. The outermost part of the perichondrium is known as fibrous perichondrium because collagen fibers are abundant, but fibroblasts and many blood vessels are also found. The inner part of the perichondrium is referred as chondrogenic perichondrium because chondroblasts are generated from this layer. 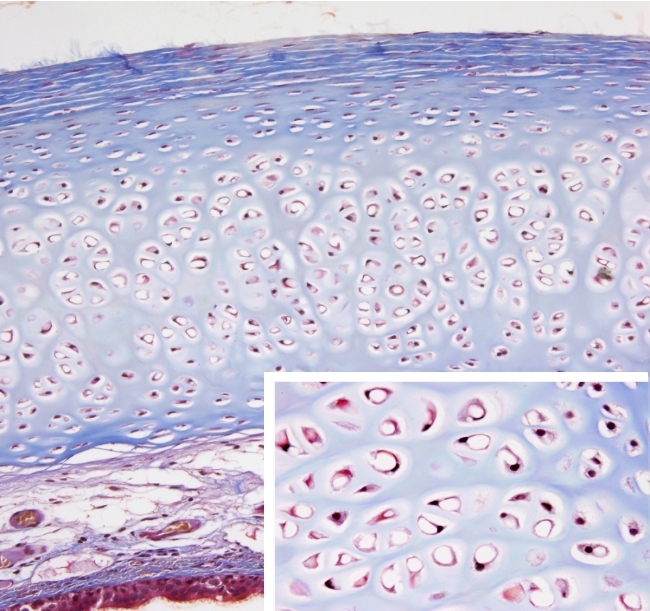 Chondroblasts differentiate in chondrocytes, which become integrated in the mature cartilage as the same time as they synthesize new extracellular matrix. This type of cartilage growth is known as appositional growth. When chondrocytes are able to divide, cartilage grows by interstitial growth.